At the start of the 19th Century milliners were creating bonnets with excessive trimmings like flowers, feathers and even butterflies and stuffed birds. Bonnets were fastened with ribbon tied under the chin, often finished with an outsized bow. By the later 1870’s smaller, neater hats were fashionable that perched on the head or supported elaborate hairstyles. These were tied with a small ribbon through the hair and knotted at the back of the head. 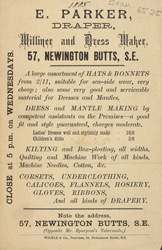 In contrast to the brightly coloured bonnets men wore sombre, black hats in a variety of shapes from the bowler and topper to straw boaters with narrow black ribbons.